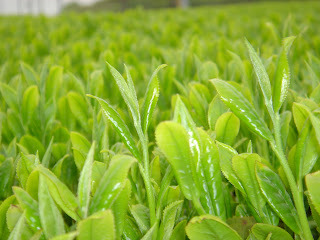 Japanese Tea Story : Long-awaited "Hachijyu-hachiya"
Now, April has come. It means a “special tea day”, known as Hachiju-hachiya (literally, “eighty-eighth night”), is approaching, needless to say Sakura season. Hachiju-hachiya is one of the most important days for Japanese tea. It is a movable feast, and decided according to the traditional Japanese calendar. In 2012, it falls on May 1. It is believed that drinking green tea made from tea leaves picked on Hachiju-hachiya will bring you good health for the year. So, tea on the day can be called “good luck tea”. Tea festivals are annually held at tea-producing areas including Kyoto and Shizuoka on the day. As you know, Japanese tea industry has been facing difficulty due to the disaster of nuclear power plants. Tea people have been making great efforts to produce safety and tasty tea over the last year. Long-awaited new tea season will come very soon.